Hello. First time poster here. I found this ad on craigslist. 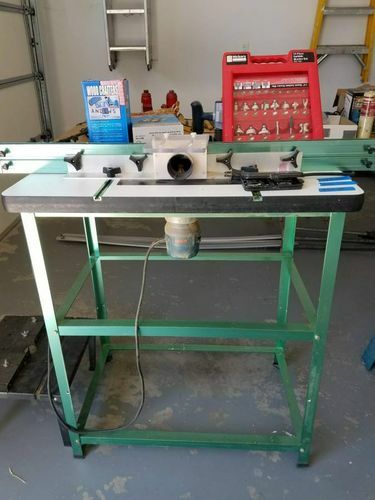 A woman is selling her husbands tool that has unfortunately passed. She has no knowledge of what the model is and the pictures are only of the backside of the table (I think she thought it was the front). Any help would be appreciated. Thanks all. Looks like it’s Grizzly green, similar versions on their website are now black, with splayed legs for $150, Looks like a Bosch router that would be around $200. The bit package isn’t of a great level, but many handy ones that can teach you what you’ll use most and replace with better. IMHO a price between $175 to $200 would be a fair price.